Midsummer Scream, Southern California’s premier Halloween, haunt and horror festival to be held July 30 – 31 at the Long Beach Convention Center, has unleashed a steady stream of announcements, from world-class theme park presentations to professional makeup demonstrations, and a massive show floor filled with artisans and vendors of the macabre. The most famous haunted house in California has now been added to the festival’s lineup; a storied mansion so legendary that its name is revered by fans and ghost hunters around the world… Winchester. The Winchester Mystery House will be hosting an unprecedented 60-minute presentation and panel discussion on Sunday July 31 featuring rare photographs, never-before-seen footage and ghost stories from the sprawling 160-room Victorian mansion in the San Francisco Bay Area. 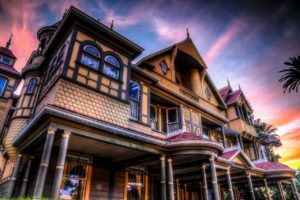 WINCHESTER: California’s Original Haunted House will feature Walter Magnuson, General Manager Winchester Mystery House; Tim O’Day, Director of Communications for Winchester Mystery House; and Peter Overstreet, event producer of Winchester Mystery House’s all-new Halloween Candlelight Tours. 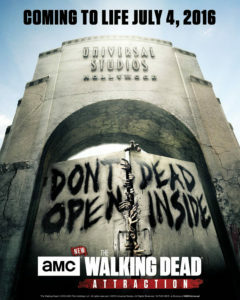 Earlier this week, Universal Studios Hollywood confirmed what fans have been speculating for a while – that a year-round attraction based on AMC’s blockbuster series The Walking Dead is close to opening at the Southern California theme park. This is a major boon for haunt and horror fans in the region who lamented over the closure of Universal’s House of Horrors in summer 2014. House of Horrors was a year-round walk-through haunted attraction that featured such notable silver screen heavies as the Mummy, Wolfman, Frankenstein’s Monster, Phantom of the Opera, Dracula, Norman Bates, and more. It’s closure and demolition was part of the unprecedented property-wide makeover that Universal Studios Hollywood is still undergoing in large to make way for The Wizarding World of Harry Potter, which opened last month. For the past five years, The Walking Dead has been a featured intellectual property at Universal Studios Hollywood during its annual Halloween Horror Nights event, taking on every form from sprawling scare zone to intense mazes reflecting whichever season ended that spring. Over time, two very defined groups of fans have found their voice – those who are totally into The Walking Dead, and those who have had more than enough of it at Halloween Horror Nights. The latter group becomes more and more vocal online each season that Universal announces that The Walking Dead will be returning. Personally, I’m a huge fan of the show, and I’ve already figured that it’ll be part of HHN for at least a year after the show finally ends. Let’s have a party, there’s a full moon in the sky! 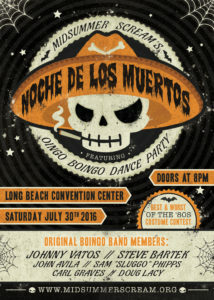 Midsummer Scream is thrilled to announce Oingo Boingo Dance Party will headline its Noche de los Muertos (Night of the Dead) celebration and costume contest at the Long Beach Convention Center Saturday evening July 30th, 2016. Oingo Boingo Dance Party is comprised of former Oingo Boingo members Johnny Vatos, Steve Bartek, John Avila, Sam “Sluggo” Phipps, Carl Graves and Doug Lacy, along with a host of other wildly-talented musicians that keep the legacy of the iconic band alive and thriving for fans of multiple generations. Known for their unique sound which includes explosive percussion, electrifying guitar riffs and a full horns section, Oingo Boingo’s extensive song catalogue includes Only a Lad, Little Girls, Weird Science, No One Lives Forever, and the venerable Dead Man’s Party. The band hosted Halloween shows in Irvine each year at the height of its popularity, with thousands of “Tender Lumplings” – the given nickname for their adoring fans – showing up in costumes and skeletal makeup, as the underlying thematic style of the group commonly centered around Dia de los Muertos. Veteran special effects makeup artist Larry Bones and his world-class team of artists from Bone Yard Effects will turn a host of volunteers into savage creatures that will roam the show floor and Hall of Shadows during this summer’s Midsummer Scream Halloween Festival held July 30 – 31 at the Long Beach Convention Center. Bones, whose film credits include Congo, Outbreak and Shallow Hal, will oversee the transformation of dozens of volunteers throughout the weekend to populate the entire Midsummer Scream venue, from the ominous Hall of Shadows to the vendor/exhibitor show floor and beyond. For the past 10 years, Larry has overseen the makeup needs for Universal Studios Hollywood Halloween Horror Nights. A huge kudos to the Berry Farm team for its 2016 Knott’s for the Cure effort, benefiting Susan G. Komen Orange County in the fight against breast cancer. 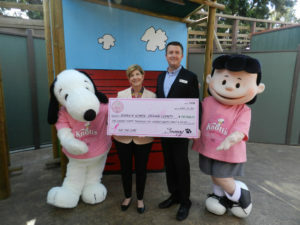 This year, Knott’s Berry Farm raised $130,588 between January and March through its extensive campaign in Buena Park. Each year, the SoCal theme park does a heck of a job promoting breast cancer awareness – from selling pink-colored tickets and merchandise, to lighting up some of its iconic attractions in “breast cancer awareness pink”. Knott’s has done a stand-up job at not only calling attention to this cause – which we’re all responsible to shed light on – but putting their money where their mouth is and raising a lot of cash for the Susan G. Komen foundation.